My model Darjeeling Himalayan Railway. I am proud of the fact that the Darjeeling Himalayan Railway is not only a means of transport but also a way of life of the Darjeeling Hills. This railway, not only has given the people of these hills, the opportunity to provide us with good education and employment directly or indirectly, but is instrumental in changing our way of life for the better, and above all it gave us an important Identity. Therefore, this ”O” gauge model D.H. Railway is made to honor all those railway men, past and present, for constructing, maintaining and running it and keeping D.H.R. almost intact, against all odds, till today, 2010. 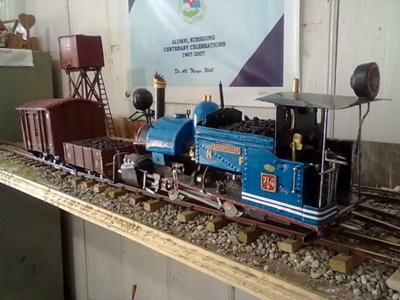 This model of the Darjeeling Himalayan Railway is not just a toy train set for display, but an attempt to preserve the real D.H.R. in my own special way. I started rudimentary modeling at a very early age. I had seen pictures of absolutely fantastic railway models in an English railway book in the mid 50s. My uncle, Late Ganesh Karki, an avid modeler himself, had an imported HO gauge tin train set which he ran on an oval track in his house, which amazed and thrilled us as kids and ignited my intense interest to model trains for myself. Later, while in school, during the 1962 Chinese conflict, aircraft was my craze, but the desire to model the D.H.R. never left me. During my school days I had modeled the entire meter gauge station yard of Dohomoni junction on the Mal - Changrabanda section of the N.F.Railway, when my father, was posted there as senior track engineer. I had made static trains, locomotives and carriages in chalk and placed it on this model yard. In our school days, my father, an expert wood carver, made wooden meter gauge steam engines of the YP class, for my brother and me to play with. This in a way further increased my interest in making models trains. As the years rolled by and restricted by my government job I lost touch with D.H.R. until my retirement in the year 2006. This fortunately was a blessing in disguise, for at last, I had plenty of time on my hands for modeling. Besides this, an important factor that came about, was the declaration of the Darjeeling Himalayan Railway as a World Heritage site in 2nd December 1999 and at this juncture my association with the members of the Darjeeling Himalayan Railway Society (UK) was an important event that introduced me to many good people on the other side of the globe, with their love for the D.H.R. almost to being fanatics and helped me model this railway. Although my handmade models lack the fine finishes that are available in the UK, USA, and Japan model (factory made), nonetheless I have a D.H.R. working model in my house with help from the members of D.H.R.S. (UK). The details of the models and measurements were very difficult to get, at first, but somehow I managed to get by. Taking measurements from the real thing, by eye estimation and getting details from my father. It was an adventure of sorts. It is a pity that till date, no model trains are marketed in India by famous railway modelers from the UK or USA, missing a huge market, whereas model aircrafts, boats and cars are available and widely sold. These models of mine are made from wood, copper, iron and tin, soldered or stuck together. The gauge is 32mm and my model is slightly off scale, as I did not have any drawings when I started off, but built it by eye estimation. I also keep on adding items to my models and tracks. My recent additions are the half wagon and a goods wagon, all made out of cardboard and an old plywood sheet, very easy to work with. I hope that in due course that I can replicate all main items including the topography to fully enjoy my model D.H.R. and I try to reflect the real thing as close as possible. The period chosen is from early 1960s to late 1970s, when my late father was in service during this time. chassis and 6V motor with gears, bought from a modeling firm, I.P.Engineering, UK. My good friend Mr. Barry Winston helped me to procure it, which suits the D.H.R. steam model perfectly. I have decided to dedicate this B. Class steam engine, to my late father, who passed away at the age of 94 years, on 18th. of October 2007. He was the track engineer from 1942 (under the British D.H.R.administration) to 1972(under N.F.Railway) on this world famous heritage railway, “The Darjeeling Himalayan Railway”. His contribution to this world famous, two feet narrow gauge mountain railway was immeasurable. He had a fantastic knowledge about the D.H.R. in all respects and provided valuable information, pictures and drawings to the D.H.R. Historian, Late Mr. Terry Martin, for his book “The Iron Sherpa” Vol.I, which was published in 2008. His directions on this model and how to make and lay the track, points and crossover for my model railway was of a great help. My friend, Mr. Barry Winston was kind enough to procure for me, motor, wheel sets, rails for the tracks and the engine nameplates “BANSHIDHAR” made in UK. I have fixed this on the new model engine, dedicating it to my late father, on his 96th Birth Anniversary. The number of this engine is 714 B the first number is the year he passed away (2007) and the number 14 is the year (1914) when he was born. Further additions to the model D.H.R. have been the crossover sets. I have hand made these points and levers on the layout for track switching operations. I have also added trees made out of wire and short jute twine. Very simple but looks great and also laid down flock grass made out of sponge bits. Recent addition to the collection is the model of NDM Diesel engine, which also runs on 3 – 6 volts battery power. Besides this I have also added two carriages (boogie wheeled) in scale with the engines. The 32mm gauge, full O scale layout can occupy quite a lot of space. I have, very little space for the model and so decided to build a small shelf (65 X 18 inches) layout, for the moment to exhibit the railway. The shelf layout has three crossovers, one water tank, a tools box of the gangmen and some scenery to match. Hope to keep on adding and maybe have the full layout in a year’s time. This year I started to model in a smaller HO gauge, (16mm gauge) as because of the space limit. I have made one B class steam engine and one NDM diesel engine. The diesel engine runs well but I’m having problems with the steam engine as I do not posses any wheel sets that match this engine. I also have an Oval plastic track to go with it. Getting wheels and parts are a huge problem and so have kept these in abeyance till such time when I am able to get the right wheels and parts. The proposed simple layouts as seen here, will have to be modified accordingly, so as to build it in a limited space. Lately, the model “B-Class” Steam Locomotive “Banshidhar” engine no.714B has developed some gear problems. I have asked my good friend Barry Winston to send some new gears from I.P.Engineering Ltd. UK. Have added more details to the steam engine “Banshidhar”. Currently its under overhaul and repairs. The parts for the engine 714 have not arrived as yet. The inordinate delay in the postal services is worrisome, for if the parts don’t arrive, then I’ll have to reassemble the engine with the worn out gears, and make do. The much-awaited new gears for the model engine finally arrived from U.K. sent by my friend Barry Winston. Finally 714B is back in action after the overhaul with new axle and worm gears. Today also is “LORD BISWAKARMA” Day a holy event for invoking the Blessings and protection from the “Lord of Works & Machines” Lord Biswakarma. Comments for My model Darjeeling Himalayan Railway. I went to Darjeeling in 1984 with my father and family. I stayed 15 days. Then I was 17 years old. I clearly remember those golden days. Best experience is riding DHR journey. Now I am above 50years. But that experience I never forget. ........ after seeing your model I like to have a she model. But in kolkata it is not available. I tried very much. Long live D H R ..
We came to Dharjeeling on 14 th May,and tried to contact your good selves, but could not, due to our tight tour schedule.However we are previlaged to make a journey to Ghoom and back by our fascinating D H R. We are delighted to have two D H R s puffing one behind the other.On our return journey we tried again to come via Kurseong.But our cab took a route via Teesta to reach N J P,from Gangtok. O.K. Better luck next time to see your splendid D H R Models. In Dharjeeling , I saw three D H R models in a Finance Company near Hotel Society on the main road.Now I am making a running model of D H R. I am a life member of Indian Steam Railway Society,and I already have Nilgiri Mountan Railway model,Kalka Simla Railway model and more than 30 working models of G,OO,HO, S,TT, N and Z gauges.My contact number is 91- 9444452001.We welcome u to our home in Porur, whenever u come to Chennai. Tata... Cherio... Bye Bye... dearly Thumanivannan. My association with the DHR goes back to 1962 when my father was the Chief Electrical Engineer NF Railway & I was a student of Goethals Kurseong. Rather late, but I am now into early stages of model trains. Have been looking for model DH trains & am facinated by your work. Am eager to get my hands on a sample : would be great if u could guide me : do please contact me at devinderjit19@gmail.com : it shall be my pleasure. Many thanks to all who commented on D.H.R. Its a marvel of British engineering and kept alive for more than 130 years, now. Your interests makes it worthwhile. It was inspiring to see that there are railway modellers in India like you who use materials available in the local market and their skills in order to remain loyal to their hobby. Thanks Chris. I know the difficulties faced by model railroaders but here in India we are a small bunch of blokes trying our best to keep up the good work despite the odds. Its sad to say that the D.H.R. now a days is going through very bad days and if nothing is done by us locals and counting on the foreign support the line faces closer. While looking for photos of the DHR ( I have just bought a HOe scale kit of the 040 loco), I stumbled upon your site. Congratulations on a very good looking model. Here in Australia it is hard enough to get some modelling items , I would think that in India it is even harder!! Keep up the excellent work. I can appreciate how much the DHR means to you and the close link to keep your Father's name and alive. The "Toy Train" played an important part in my life throughout my many years in Kurseong. Besides the wonderful scenery, the sunsets, I used to be fascinated by the sight,smell and sound of our steam engine. As a student I spent many an hour waiting anxiously for the sound of the whistle as the 'bastion' chugged its way from its first appearance at 'Last Bend" and "I THINK I CAN,ITHINK I CAN" as it zigzagged its way past St Mary's Dara and then disappeared after Dhobie Jhora but it picked speed on the straight as it belched clouds of sweet-smelling steam coal. Then to follow the thin blue line as it crawled to Darjeeling. The silent rattle it made on its descent was in complete contrast but still mesmerising. Thank you for reviving memories and keeping my senses alive albeit in the clouds. Great to know that you're still interested in the DHR which has always been a part of Darjeeling or Dorje-ling.We Nepalis & Gorkhalis like to call it 'Dar-ling' and in a way, it is a darling, this small train which has been chugging and snorting from the plains to the hills of DJ, an endearing and useful train which enhances the landscape of the Darjeeling hills. Glad that you're promoting your small project, my friend, and I'd like to wish you joy and comfort and 'viel Spass'in your excellent hobby.